Mehuli Ghosh and Apurvi Chandela have further extended India’s unparalleled dominance in shooting as they won the silver and bronze medal respectively in the 10m Air Rifle category. The wins came after Jitu Rai had clinched the gold and Om Mitharval, the bronze in the 10m Air Pistol. After Apurvi Chandela qualified for the final with a Commonwealth qualification record of 432.2, expectations were extremely high from the defending Champion. Her compatriot, Mehuli Ghosh, qualified from the fifth spot and had her share of hopes too. However, as has always been the case, the final saw a whole different picture. The gold medalist from this category in 2014 CWG, Chandela, started off poorly as she failed to keep all her shots over 10 in the Stage 1. Ghosh, however, capitalized on them and finished second to Singapore’s Martina Lindsay Veloso before the elimination stages. Only Scotland’s Seonaid Mcintosh was level with Ghosh. However, their performance improved brilliantly in the elimination stage when Singapore’s Tessa Neo, local favorite Victoria Rossiter, Wales’ Sian Corish and Mcintosh all bowed out one after the other. There was a big gap between the third-placed Chandela and fourth-placed Ummey Sultana of Bangladesh, which had guaranteed India a bronze by the fifth elimination round itself. However, Chandela could hardly take any advantage when the time came as she scored 9.9 and 9.4 before bowing out in the second last elimination round. 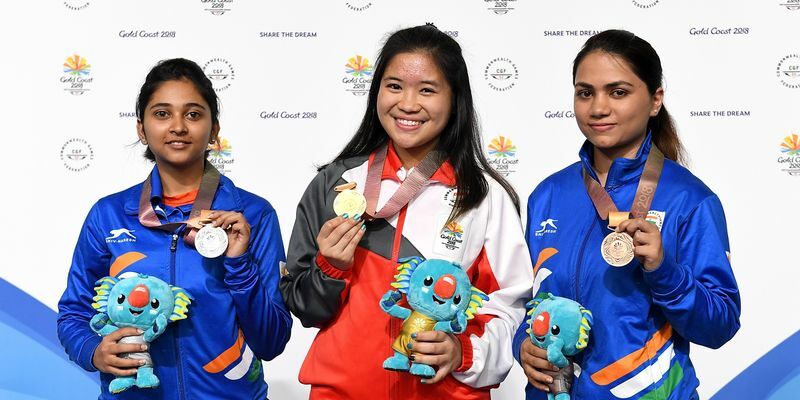 Ghosh, who was 0.8 score behind leader Veloso, had a silver medal guaranteed and the confidence was reflected in her final performance when she scored a perfect 10.9 to level Veloso’s total score of 247.2 and forced a shoot-off. The score also brought up a Commonwealth Games record for the duo. In the shoot-off, however, 17-year-old Ghosh couldn’t keep calm and shot a below-par score of 9.9 to Veloso’s 10.3.